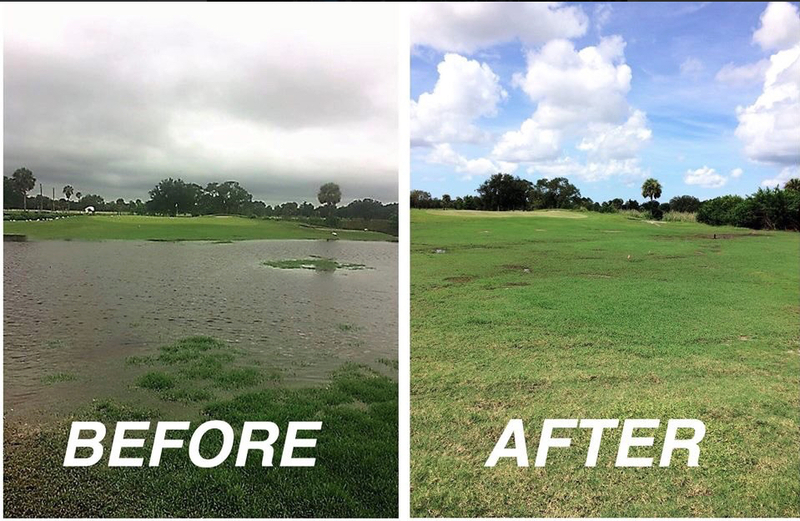 The American Course at the City of Sarasota’s Bobby Jones Golf Club has reopened “with much needed improvements to the drainage system on all 18 fairways,” City Manager Tom Barwin has announced. During heavy rain events, the course was unplayable because of “extreme puddling caused by poor drainage,” Barwin explained in his Nov. 9 newsletter. “Starting in August,” he continued, “crews dug narrow trenches in the fairways and placed pipes to direct the water to the rough or catch basins. This summer the City Commission approved limited capital improvements at Bobby Jones Golf Club to keep it open and playable while phases of a master plan are determined and implemented, Barwin added. The drainage improvements to the American Course cost $158,750, city Senior Communications Manager Jan Thornburg told The Sarasota News Leaderin response to its request for the final amount. During the City Commission’s July 9 special meeting to wrap up budget issues for the 2019 fiscal year, Kelly Strickland, director of financial administration for the city, reported that ABM Landscape & Turf Service had estimated the American Course work at the amount Thornburg cited in her Nov. 13 email. The original plan anticipated the course closing in July and reopening in December. However, it did not close until August. The cost of the work was put at $12.50 per foot for a total of 12,700 feet of fairways. All damaged, grass-barren areas were to be improved, Strickland noted. Problems with water pooling on the course occurred primarily during the summer rainy season, Thornburg wrote in her Nov. 13 email. On July 9, Strickland also pointed out that staff plans call for closing the British Course for six months — from June through November 2019 — to install temporary drainage systems on all of its flood-prone fairways. Total cost of that work is estimated at $161,375. Again, the firm providing that estimate was ABM Landscape & Turf Service, which handles the golf club’s maintenance. City administrative staff and Susan Martin, manager of the Bobby Jones Golf Club, reported this summer that nationally known golf course consultant Richard Mandell of Pinehurst, N.C. — who has worked with Martin and her staff on the master plan — will meet again at some point with the City Commission to assist it in determining how to proceed on long-range plans for the club facilities. During a May 31 special meeting, the City Commission talked with Martin and Mandell about a revised master plan that would entail $17 million in repairs and new construction to make all 45 of the golf club’s holes conform once again to high standards. Most of the board members have indicated support for significant improvements to the property, but Commissioner Hagen Brody repeatedly has offered the view that interest in golf is waning and that the city would be more fiscally prudent if it opted for a master plan that eliminated part of the club’s holes. Because the City Commission reduced funding for upkeep of the property during the Great Recession, deterioration of the British and American courses reduced interest among players and resulted in less revenue for the Bobby Jones Golf Club in recent years, Martin has explained. As a result, the commission had to approve subsidies for the club in the 2018 fiscal year and again in the new fiscal year. The 2019 amount is projected to be $650,000. The current fiscal year began on Oct. 1. As part of the city’s 2019 budget, the City Commission approved the implementation of a $5 fee per 18-hole round to be designated for improvements of the golf club’s facilities. That would take effect in December, Martin, the club manager, indicated during the July 9 discussion. Based on the number of 18-hole rounds played in the 2017 fiscal year, the fee is expected to generate $244,650. Additionally, a $2.50 fee was added to the cost of each nine-hole round, also for capital improvements. That is expected to bring in $53,850. Altogether, if the staff estimates prove to be on the mark, the revenue from the fees will be about $298,500.